This recipe is from the back of the Reese’s Peanut Butter Chip Bag. I’m putting it here for safe keeping and as a reminder to myself to make these with Hershey’s Dark cocoa powder. They are good with natural cocoa powder, but people seem to like the dark chocolate version best. Cream butter, sugar, eggs and vanilla until light and fluffy. Combine flour, cocoa, baking soda and salt; add to creamed mixture. Stir in peanut butter chips. Drop by teaspoonfuls (or use tablespoons) onto ungreased cookie sheet, or chill until firm enough to handle and shape small amounts of dough into 1 inch balls. Place on ungreased cookie sheet. Bake at 350 degrees f for 8-10 minutes. Cool 1 minute before removing from cookie sheet onto wire rack. About 5 dozen. Thank you so much for this recipe!!! !the bag is not a good recipe,this is! I made these with my grandma when I was younger, found the bag years later and thought the outcoming cookie was a little different. Thank you for posting this one! I’m heading to the kitchen right now! Shannon, this is the *old* back of the bag recipe. I think they changed it quite a bit. So maybe that’s why it worked out. At any rate, I like this one too. Thanks for the comment! I love the idea of adding mint. I’m in Chicago right now and just saw a bunch of Frango baking mints and Macy’s. I’ll bet those would work too. 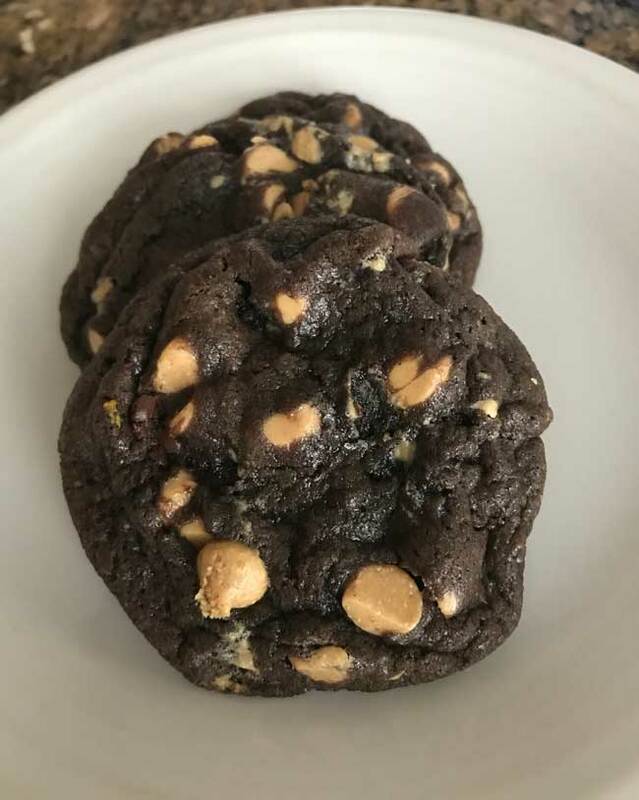 I found this recipe via an exaustive search for a GOOD chocolate cookie dough that didn’t require a double boiler and a lot of needless complications. It is AWESOME. One variant that I tried that I must share, because it was fabulous, and my husband won’t stop raving about it: Instead of peanut butter chips, I broke a bunch of Andes Mint candies into small pieces (about 6 chunks per mint). Two cups of those pieces, plus one cup of semi-sweet morsels and YUM. I totally love those old cookbooks put out by companies like that – I have an old Nestle one and an old Hershey one that are great. I just couldn’t believe there were so many up for sale, I thought I’d never find it! Ms. Chevious, I hope you like the book. Even if you never make anything out of it, it’s fun to read the recipes and see the ideas different companies have for their products.